Saturday was the Indianapolis Monumental Marathon. This was my 3rd time running this marathon. First at the inaugural event in 2008, 2015 & then this 2016 version. The race has grown by leaps and bounds because its well ran and has a reputation for being flat and fast. This was my fastest marathon for 2015 and my 2nd fastest this year (and I’m not at all in good shape right now). Its small enough to feel intimate but big enough to feel fun and like a real road race. I really love it. The expo is medium sized. Local vendors. We found some good deals from a local run store that had 30% off everything, even high tech winter run jackets! Packet pick up was smooth & fast. They also give a commemorative poster which lists every registered participants name. Nice touch. This is last years poster (hard to see with the glare in my sun room, sorry). The one this year wasn’t as cool and I doubt I’ll put it up but I love that they do this. 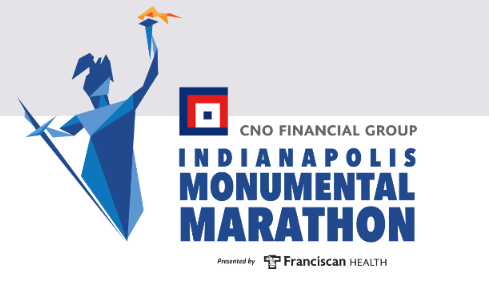 The Monumental Marathon is a downtown Indianapolis race. We stayed downtown so that we could walk to the expo, dinner and the start/finish line! I think we left our hotel 30 minutes before the start and had plenty of time. There are start corrals but they are not policed so as always, plan for slower runners to find their way to the front. Its inevitable. The first mile is very crowded and slow. 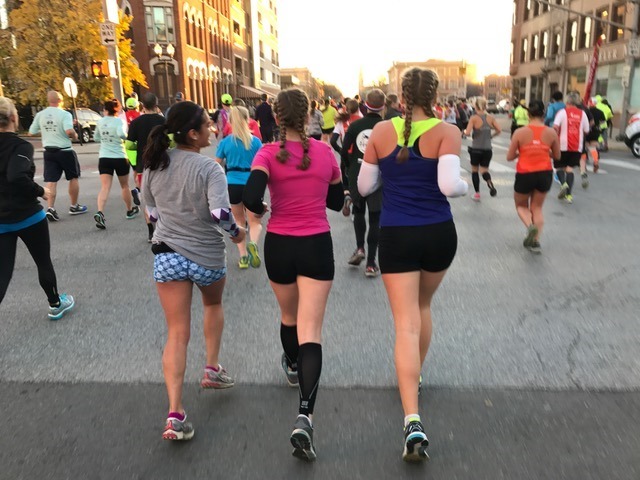 If you are looking to hit a particular pace from mile one, that’s difficult and I’d encourage you to start closer to the front, or plan accordingly for that first mile to be a minute slower. Try to take it all in before you put the hammer down, enjoy the city and the crowds and the remember why you run. This is a race where I normally have a lot of friends running with me, so we just start behind the corrals and enjoy ourselves. We don’t rush. We don’t push. We just run. Things definitely thin out after a couple miles but really, there are quite a few runners until the half marathon turns off around mile 7.5. This year my crew had 3 high school girls in tow. They were running the half. One for the first time. Two for the second time. So I just stuck with them and had fun. I love watching the enthusiasm of young runners. These 3 ran Cross Country for their school this fall and they have a lot of spirit. They entertained the crowd around them the entire time by cheering, yelling & singing. I loved every minute of it. This is what running is to me …. fun, fitness & friendship. M, A & Aby (on the right). They are getting ready to turn off for the half. Good luck, girls!! The half and the full sold out this year. 2016 was the biggest year so far. They had 8,154 finisher for the half. 2,762 finishers for the 5K. And 4,237 finishers for the full. 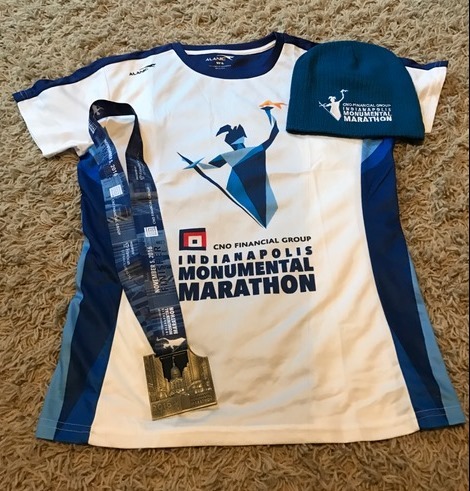 There was also an extra medal for the runners who ran both the Indianapolis Half Marathon earlier in October, in addition to the Monumental Half. More Bling = More Runners! As the half turned off, the road opened up in front of me and I think we all sighed from relief. I love the energy from the half runners but its nice to get down to business and start focusing on my race. I remember feeling the same way last year. It doesn’t scare me that the crowds thin. We still have ample spectator support. There were still a lot of runners out there. I was never alone, just free to run whatever pace I wanted. It was a great day. Warmish. I saw several bloggers report that it was in the high 30s when we started but it wasn’t that cool according to my AccuWeather app. It was 47-50 degrees by the 8am start time. No wind. And the sun was coming up. My crew had on arm sleeves and could have gotten away without them. I was very comfortable pre-race in shorts, a tank & arm sleeves. And it was going to heat up as we ran. Time to get down to business and run. After the half split, we headed to the State Fair Grounds. Then a long straight stretch down Washington Boulevard. Love this part. Lots of room to run and it’s a night straight stretch that doesn’t require much thinking. Not a lot to see. Traffic on the other side of the road but many motorists cheer us on as they wait in traffic. Then onto Broadripple. Riverview, which is short but scenic. Meridian Drive. Butler University. Beautiful campus. Lots of older alums hanging out but where are the students? Indianapolis Museum of Art. Lovely area. White River Parkway. Burdsal Parkway. Miles 21-22 ocne and go, that always seem to be a challeng. Fall Creek Parkway. Back on Meridian and heading back downtown, we are getting close!!! We can see Monument Circle in the distance and keep pushing forward. Finally, mile 25. Then 26. Then the finish. That lovely finish. Another one in the books. Thank you, Lord. Thank you, body. Thank you, mind for pushing me thru another finish. In all, this is a great race. I’d love to run it again next year if it fits into my schedule. Lots of water & potty stops, plus medial about every 1-1.5 miles. 20 aid stations in all. They also had at least 5 food/fueling stations. Plus so many kind spectators that set up their own personal aid stations offering Halloween Candy, beer, water, pretzels, oranges, etc. Great race. Great community & spectator support. Thanks, Indy! Swag: Gender specific tee, finishers hat & medal. Last year we got a hat too. That one had the year embroidered on the hat. This one was more “generic”, probably so they can use leftovers for years to come. Great race, hope to see YOU next year! 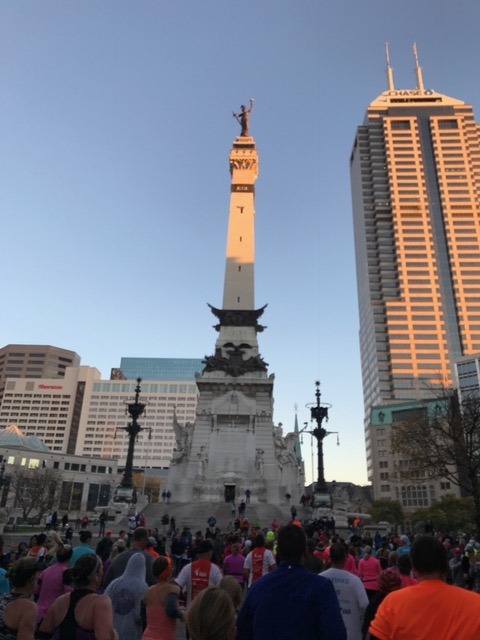 This entry was posted in Family, Fitness, Race Reviews, Running and tagged Be Monumental, Indianapolis Monumental Marathon, Marathon, Marathon Maniac, Monumental Marathon, Run Indiana, Run Indy, Running by tootallfritz. Bookmark the permalink. I know TTF….your gonna sigh…me again cause you know my “bad” experience with Indy! LOL. But to tell you the truth…you describe it accurately and well….and in my humble opinion….it is fine, lower-key race event and Indianapolis is a marvelous city to spend time in. That I know…cause my brother lives there! Gee, didn’t know they had a poster like that with all the participants names on it like Boston does! That makes sense cause when I was there….spent no real time at Expo other than to get my packet and out and back to my brother’s race….but then again, never recall last year when I ran it….seeing anyone handing out posters. Drats! You describe the start and corrals accurately. I still wish they would work on something better. 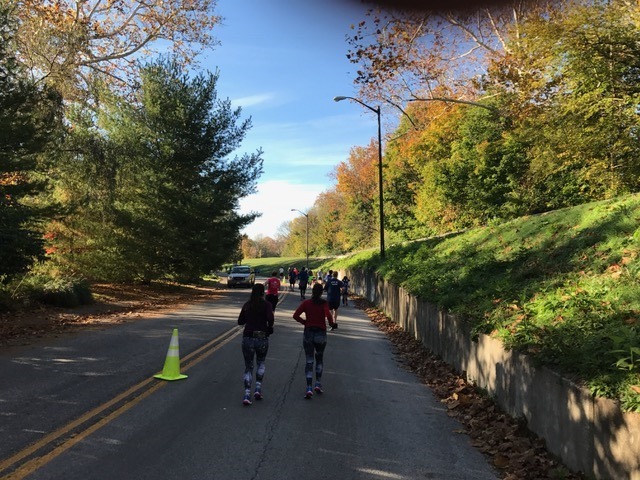 It is not simply the 1st mile you contend with the slow-blockades…but many miles…at least in 2015….and really…I never made clearer freedom until almost 6-mi out. Part of that was as you know was way back from my “seeded” corral. And being one contends with GI-issues/syndrome….way back there lase corral….in line where they put the porta-potties. If they had some up closer to the front-end corrals…..might make a big difference. Some may criticize me as “sour grapes”….but I only signed up to run that race in attempt to run a Boston Qualifying Time….and the aspects of that start and its configuration….dictated events later that ended up in physiological melt-down by mild 20….no way to get anywhere near a better QT! I will disagree with you on one point….it is not flat-fast course. It has some hills in it in places and at stages that one must contend with…albeit nothing excessive or out of the normal of midwestern glaciated landscape….but it is not “flat.” Whether it is “fast”….could be. 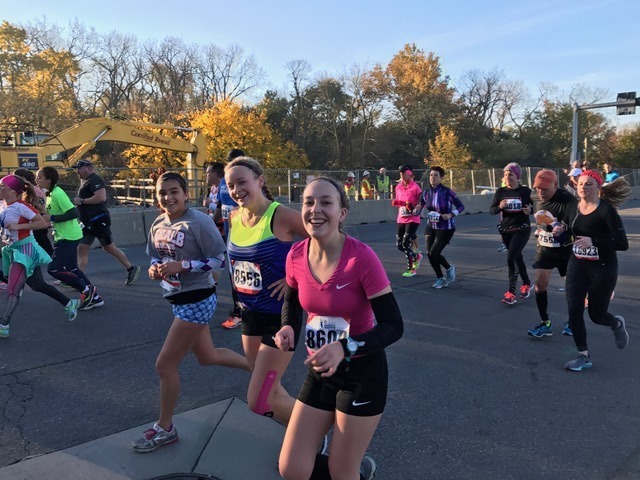 Run this race if you just want to do a marathon and run it for fun….or you don’t have to mess with aspects that bring you to your start corral last-minute….and have plenty of time to stand and wait out the start way up front….if you want to run fast and performance-based BQT’s. But other than my technical complaints….you capture the essence and beauty of that race and its course! Good job!